Rediff – In addition to the World Test Championship, 12 Test playing nations and the Netherlands will participate in the 13-team ODI League, which will run from May 1, 2020 to March 31, 2022. 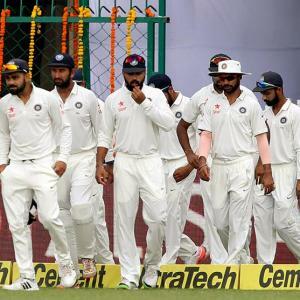 India will travel to the West Indies for their opening series in the inaugural World Test Championship (WTC), the ICC announced on Wednesday as it released the Future Tours Program for the 2018-2023 cycle. India’s next couple of series in WTC will take place in New Zealand (two Tests) and Australia (four Tests) in 2020-2021 before they play England in a five-Test series at home. The WTC series against New Zealand in 2020 will have Tests but no five-day games are scheduled when India travel to play the Black Caps next year. In addition to the WTC, 12 Test playing nations and the Netherlands will participate in the 13-team ODI League, which will run from May 1, 2020 to March 31, 2022 and all the sides will play eight series over a two-year cycle on a home and away basis against mutually agreed opponents. Hosts India plus the seven highest-ranked sides in the ODI league as on March 31, 2022 will qualify directly for the 2023 World Cup, while the bottom five sides will get a second chance to qualify through the ICC World Cup Qualifier.